A federal judge has issued a preliminary injunction prohibiting any purchases of Russian rocket engines for U.S. Air Force launches, due to concerns about U.S. sanctions against Russian officials. The concerns were raised by SpaceX, which is contesting the Air Force's multibillion-dollar plan to purchase rocket cores from the company's main competitor, United Launch Alliance. In a complaint filed this week in the U.S. Court of Federal Claims, SpaceX noted that United Launch Alliance buys RD-180 rocket engines from a Russian state-controlled company, NPO Energomash. The company argued that the arrangement may benefit Russian Deputy Prime Minister Dmitry Rogozin, who oversees Russia's space effort and is on a list of officials targeted by economic sanctions arising from the Ukraine crisis. Rogozin himself referred to the sanctions on Tuesday. He warned that they would "boomerang" to hurt America's space effort, and suggested that NASA "bring their astronauts to the International Space Station using a trampoline." In the wake of the space shuttle fleet's retirement, NASA depends on Russian spacecraft to carry its astronauts to and from the space station. SpaceX as well as two other U.S. companies, the Boeing Co. and Sierra Nevada Corp., are working on spaceships that could eventually take the place of the Russian Soyuz capsules. NASA says the downturn in U.S.-Russian relations has not affected operations on the space station, but Rogozin's comments didn't exactly help matters. Federal Claims Court Judge Susan Braden said her preliminary injunction was warranted because of the possibility that United Launch Alliance's purchase of Russian-made engines might run afoul of the sanctions. NBC News' past coverage of the issue was cited in Braden's ruling. Wednesday's injunction prohibits any future purchases or payments by the Air Force or United Launch Alliance to NPO Energomash, unless and until the Treasury Department, State Department or Commerce Department determines that the deal doesn't run counter to the U.S. sanctions against Russian officials. Braden stressed that her ruling does not affect previous payments to the Russians, or purchase orders that have already been placed. United Launch Alliance says it already has some of the engines on hand. 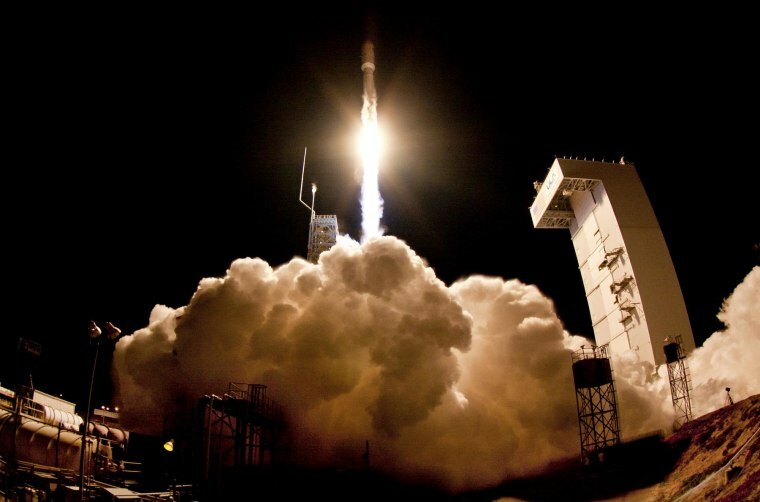 The flap over the Russian rocket engines came to the fore last Friday when SpaceX's billionaire founder, Elon Musk, announced that he was challenging the deal between the Air Force and United Launch Alliance. On Wednesday, Sen. John McCain, R-Ariz., complained that the arrangement smacked of "cronyism." He alluded to a controversial deal that the Air Force made a decade ago to buy tanker aircraft from the Boeing Co. That deal ended up sparking a procurement scandal. Boeing and Lockheed Martin are partners in United Launch Alliance, which is currently the only commercial venture certified to launch national security payloads for the Air Force. The joint venture is in line to launch such payloads as part of a "block-buy" arrangement. The Air Force's commitment in December to purchase 36 of United Launch Alliance's rocket cores — presumably including Russian-made engines — is part of the preparation for those launches. SpaceX wants the Air Force to hold up on the block-buy agreement, wait until SpaceX's Falcon 9 rocket gets the required certification, and then recompete the rocket contracts. Read the full text of Braden's order issuing a preliminary injunction. Tip o' the Log to The Washington Post, which first brought the injunction to light.